Cahuita. 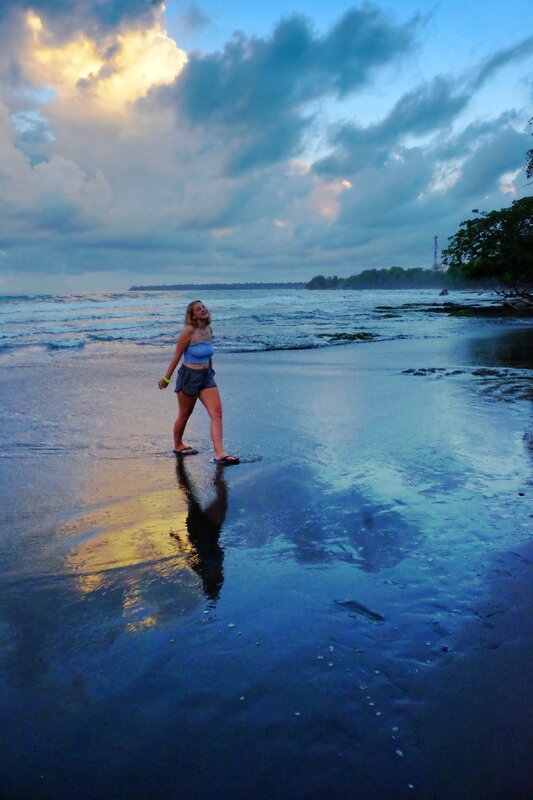 Caribbean Costa Rica! Just the grandkid and me | Where in the world is Grandma? 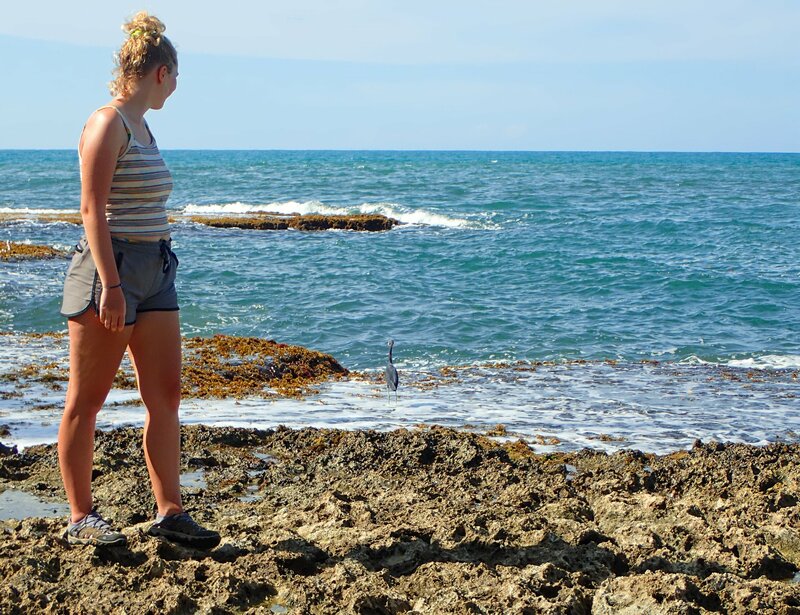 The Costa Rica adventure with my grand daughter continues. She’s graduating high school this year and I’d promised since she was little that one day she’d come with me. This is it! We started with a couple of days in San Jose. That post is here: San Jose, Costa Rica. The beginning of a great trip! Next we we did a G Adventures trip called Trek Hidden Costa Rica which was a fantastic experience. 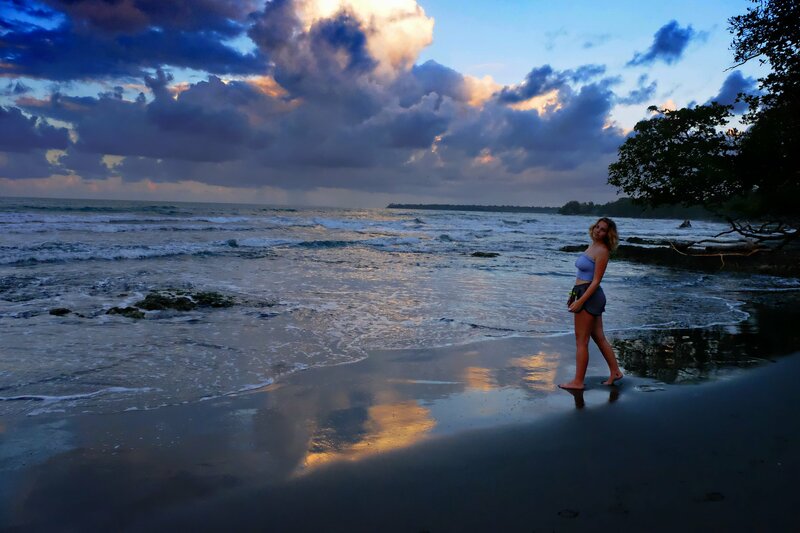 The jungle home stays post can be found here: Trek Hidden Costa Rica. Into the jungle we go! 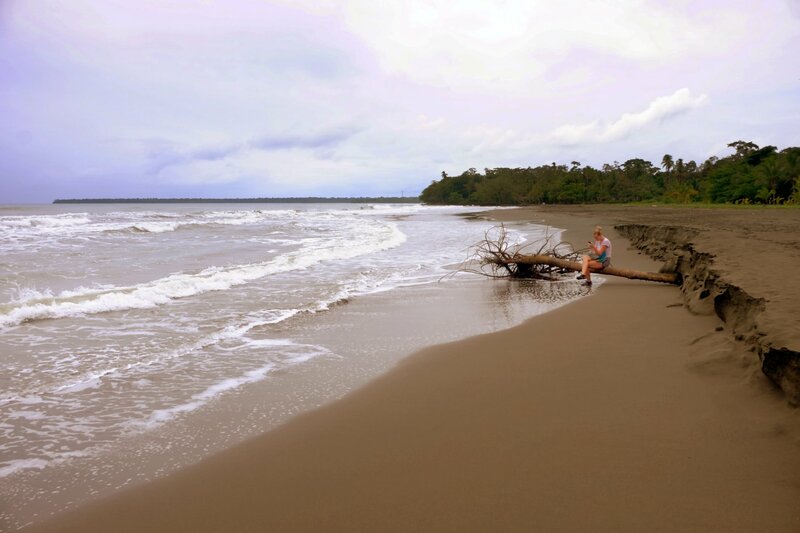 Next we spent some time in the Pacific coastal towns of Dominical and Uvita. 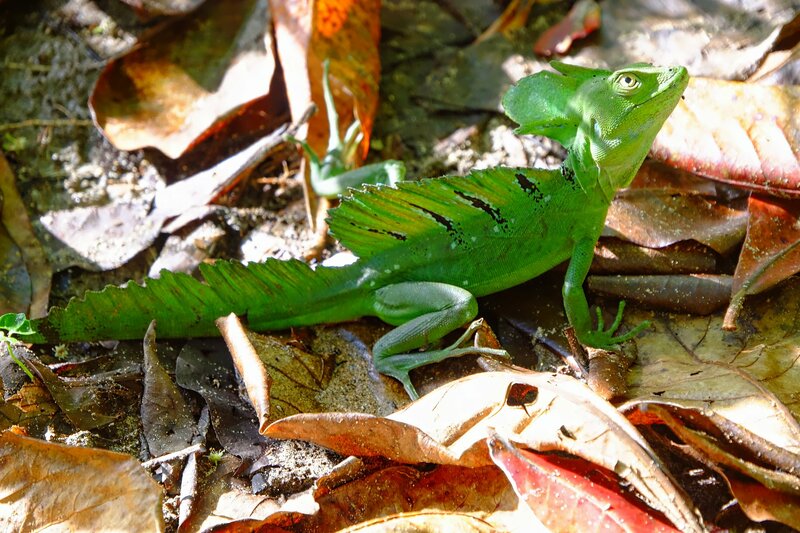 That post can be found here: Dominical & Uvita beaches plus cave dwelling at Daimonte. Costa Rica has everything! 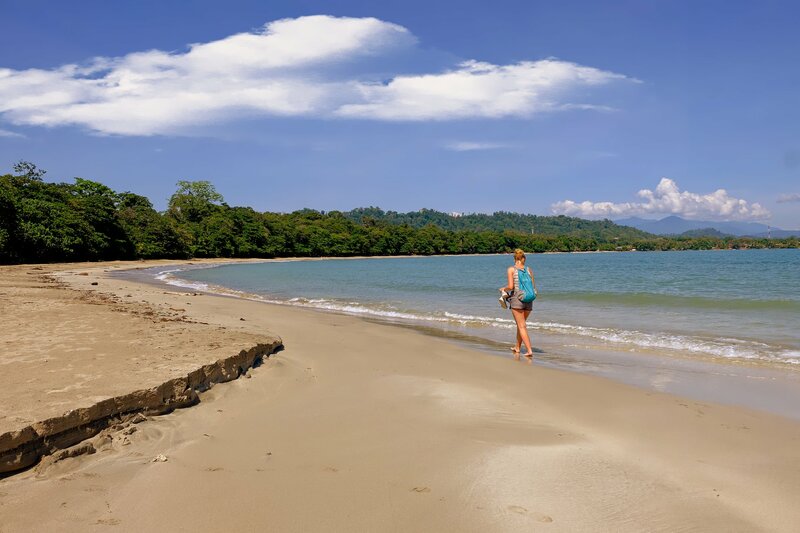 Now we’re going to the Caribbean side of Costa Rica to see how that differs from the Pacific side and enjoy some relaxation and down time. HAHA! The taxi driver I’d arranged for picked us up promptly at 7 and Nicole joined us. He brought us to the bus station and even helped us buy tickets. We hugged Nicole goodbye as she was heading to the other coast via a different bus line. We took the Mepe line to Cahuita. The taxi driver had warned us that construction on the highway meant it was going to take longer to get to Limon which would be our bathroom break. It did take a good 4 hours so we were thankful to take his advice on limiting liquids and bringing snacks. The 3.5 hour drive took closer to 5 hours altogether. That’s okay as some of the views were amazing. At one point we were high in the cloud forest, then wound down slowly and enjoyed the views along the way. Occasionally a vendor would board the bus selling some kind of snack, water or even trinkets. I love taking local buses. It gives me a bit of a look into the lifestyle of the local residents. Once in Cahuita we started walking in the direction I thought the Cabinas Palmer Makanda was. I was checking my phone (maps.me is an invaluable app!) when a woman on a porch asked what we were looking for. When I told her she graciously pointed in the direction we should go and told us what to look for. So kind! Once we’d settled in we headed for the national park, only a 5 minute walk away. 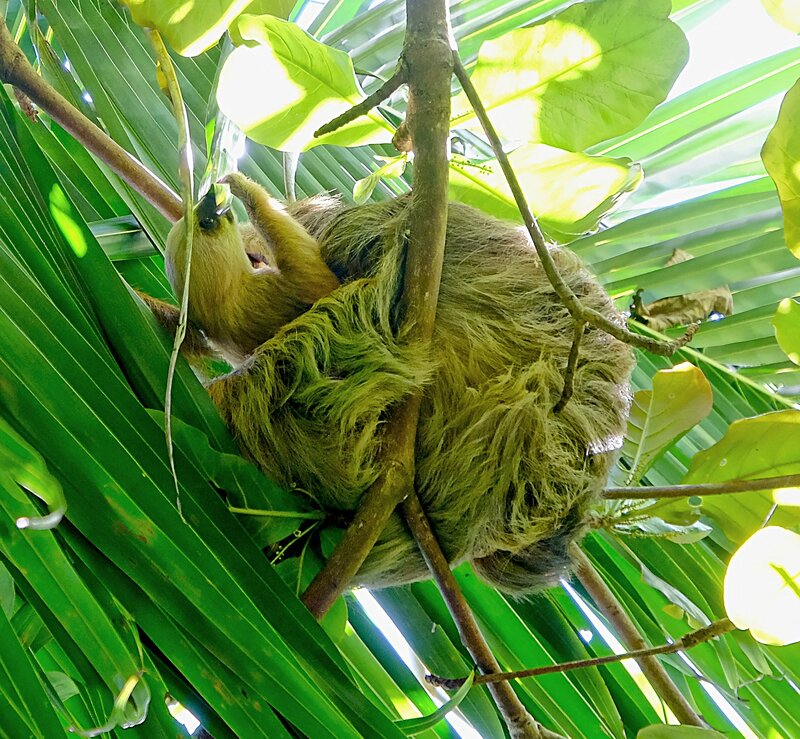 In no time we’d seen Capuchin monkeys and a sloth sleeping in a tree. It was hot so we spent the rest of our time jumping waves and enjoying the beach. Next we walked about the little town and quickly got the lay of the land. Signs pointing to Playa Negra intrigued us so we headed that way. We’ve already learned that when people seem to be just standing there staring up at a tree, it’s likely a sloth. There’s one in the tree just outside Round beach. 😉 Playa Negra was Ariel’s first time seeing a black beach. The swimming was fun and we watched some surfers before the sun started to go down and we headed back to town. Trip advisor suggested El Cangrejo Loco so we thought, why not? It was happy hour so we decided to splurge on a daquiri and a margarita. Then the power went out. I asked our waiter (pretty sure he’s also the proprietor) if we could still get dinner and he said “No problem, we use gas!” Cool. Turns out it was only out for 10 minutes so we lucked out. It was kind of nice being in the dark. It was quiet too as all the music stopped. I got Ariel up shortly after 6 am so we could get in the park early. Cahuita National park operates on donations only so I made sure to bring some money. The trail goes one way to Puerto Vargas so we turned around about 15 minutes past Cahuita point. There were portions of the trail where the mosquitoes were horrible. 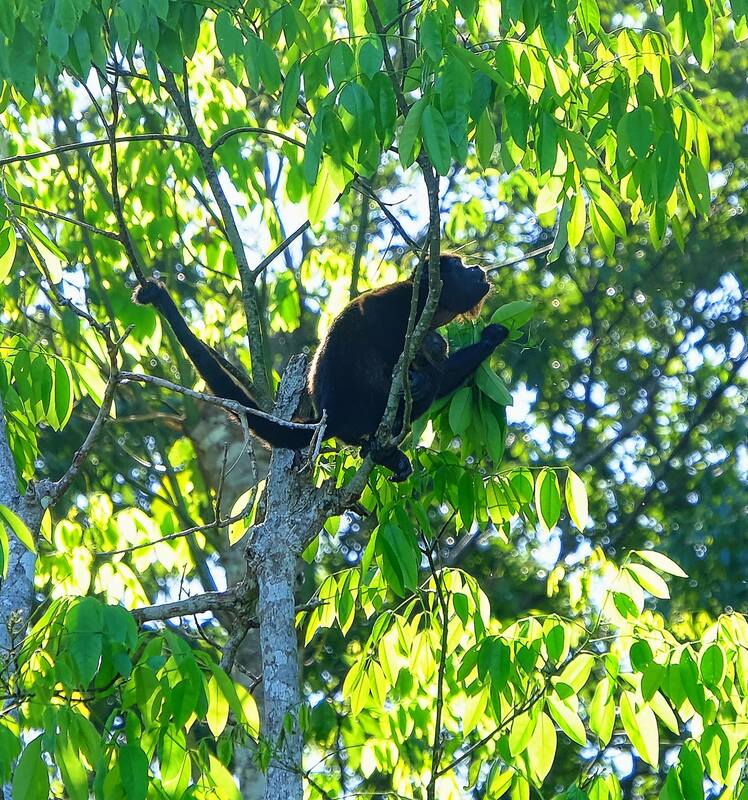 Of course that’s where we saw a troop of howler monkeys. No stopping to take pictures or enjoy them or we’d get eaten alive! By 10 am we were starving so we popped into the Soda Kawe and enjoyed a delicious typical breakfast of gallo pinto, eggs and plantain. Ariel had a strawberry smoothie. Yum! Ariel did some souvenir shopping and we spent an hour or so relaxing at the hotel. 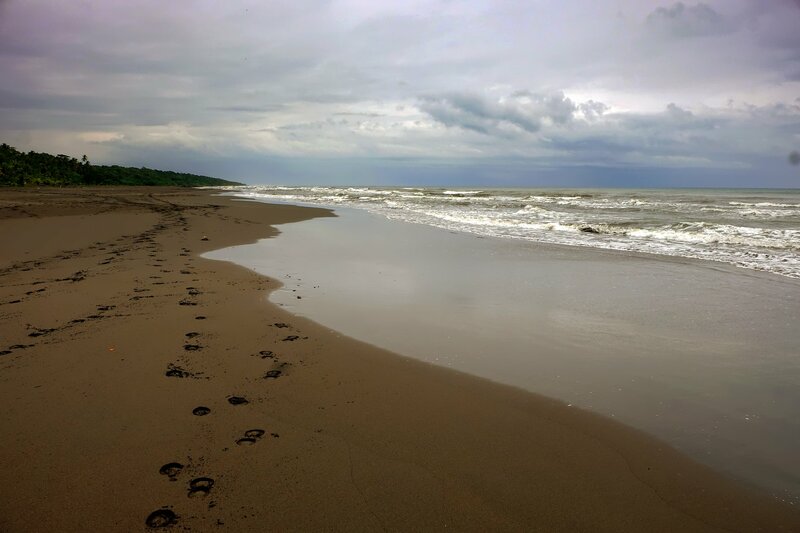 Then we headed back to the black beach as we really liked it there. Dinner was a Ricky’s bar. I had a really good heart of palm salad and Ariel said her chicken fingers were the best she’d ever tasted. I let Ariel sleep in until 7 am. Nice huh? We had purchased breakfast food so ate at the hotel which has a nice kitchen we can use and the coffee’s always on. Kendry showed up on a motorcycle to take us to the marina where his boat is docked. Ariel wasn’t so sure so I went first. He dropped me off then went back for her. A couple from France and two girls from Germany joined us as we went by boat to the National Park for snorkeling. It’s easily accessible from shore but it’s forbidden to go without a guide. The snorkeling was okay. The water was a bit murky but the highlight was when I thought I spotted a stingray and hollered at Ariel to come. When I looked back down I realized it was 3 nurse sharks thrashing around, not a ray. Cool! Kendry cut up some pineapple and bananas after snorkeling. They were so fresh and delicious! Needless to say we weren’t that hungry for lunch so …. ICE CREAM! There’s a shop near the park entrance that has amazing ice cream. So. 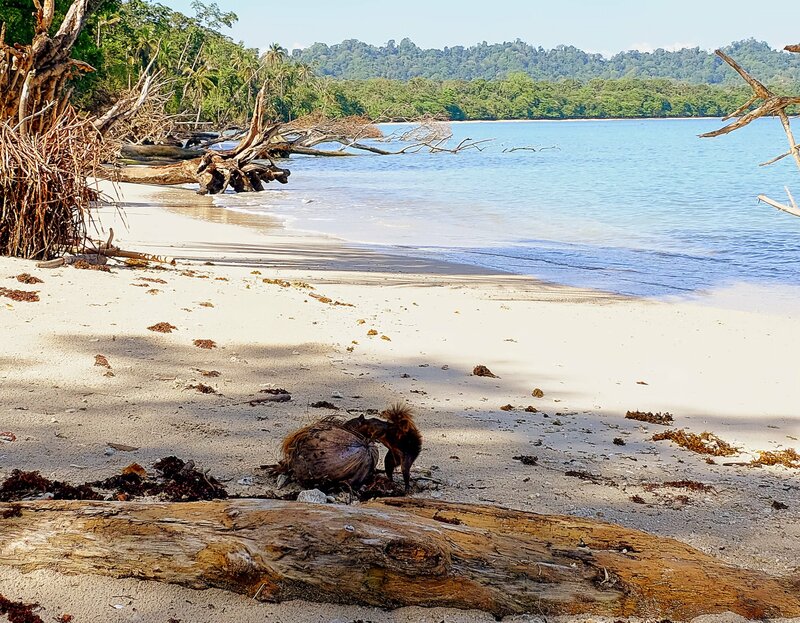 Go to Cahuita National Park and afterwards DEFINITELY stop for ice cream. Later we decided to walk to the Playa grande, then realized it was further than we thought so back to the black beach. In our wanderings there we found 4 different trees with sloths in them. Of course they were sleeping. That’s what sloths do best. Back in town we had dinner at Luisa’s and that was good too. Afterwards we stopped at a shop to rent bikes for the next day. This could be interesting. Apparently Friday is party night in Cahuita. They kept it up until 3 am. I slept through the loud music but when people left the bars they certainly didn’t use their indoor voices for conversations. I was up early anyway and let Ariel sleep until almost 8 when I got sick of waiting. I made a run to the bus station for tickets to San Jose. Finally around 9:30 am we left on the bikes for the Playa Grande which is about 4 km out of town. The road is stony and hard on delicate bums that haven’t ridden a bike in a lonnnngg time. I walked up and down the beach but saw no sign of turtles. Kendry’s buddy told us he’d seen a giant leather back laying eggs a couple of days previous. I sure would have to liked to see THAT! The Tree of Life Sanctuary has tours every day at 11 am so we made sure to be there then. Patricia showed us all the animals, some plants and gave a very informative talk about all of it. It’s also a botanical garden that encourages wildlife to stop as well. The aim is always to release the animals but it’s not always possible, especially when the animal is a former pet. It’s illegal to keep a wild animal as a pet in Costa Rica but of course, some folks don’t get it and think keeping a monkey will be fun. Until it’s not. 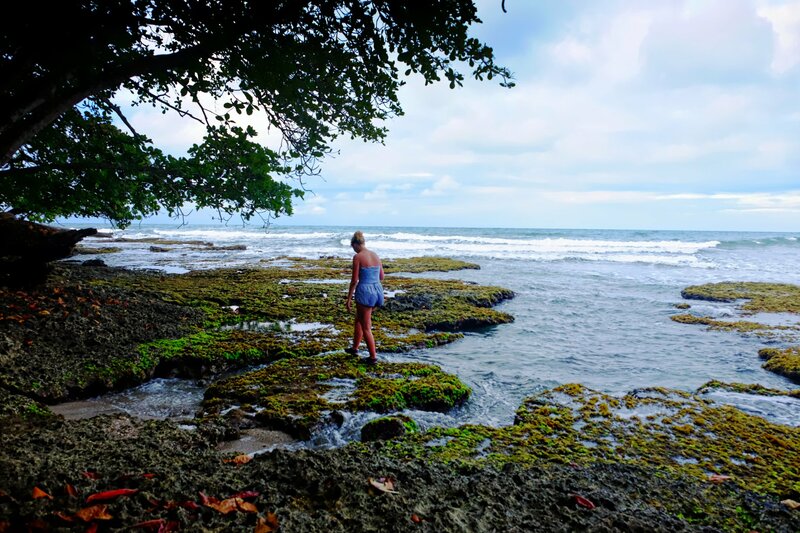 Patricia’s love for Costa Rica and its natural resources is obvious in everything she does. I’d booked the 8 am bus hoping to get a good night’s sleep as tomorrow is an early flight. No such luck. Barking dogs woke us up periodically through the night. Even ear plugs don’t work for that. We finished up the food we had for breakfast and walked to the bus stop. This one was early! Once in San Jose, I was prepared to walk to the Station Wagon bus stop but a taxi driver convinced me to take a ride as, it being Sunday and shops closed, pick pockets were rampant with the lack of police presence. I don’t know if it was true but it was just a $5 ride. For $3 we took the bus to Alejuela. There we could walk to the Casa Lapa guesthouse. Total transport for 2 from Cahuita to Alejuela, about $20. Ariel REALLY wanted McDonald’s so we headed off to find one and stumbled upon a LOT of festivities. Apparently El Tope Nacional was in town. People riding horses that DANCE. There were hundreds of them. There was lots of loud music and drinking. Even those RIDING were drinking. The only sober folks seemed to be the police who were also on horseback and walking. Next was my choice. The Tocumen Mexican ice cream store was a half hour walk in the other direction. You really need to go there when visiting Alejuela. The ice cream is amazingly good. We wandered some more, observing more festivities and trying to stay out of the way. Then spent the evening in the guesthouse where I chatted with a young man visiting from Switzerland looking for recommendations. The room was hot and stuffy so we didn’t sleep well and 4:30 am came early. By 5:15 am we were at the airport ready to board our first flight. The trip home involved 2 stops that went totally according to plan. How weird is that? All in all, it was a great trip. I’m hoping it opened Ariel’s mind to the opportunities there are to travel, learn and experience this wonderful planet. 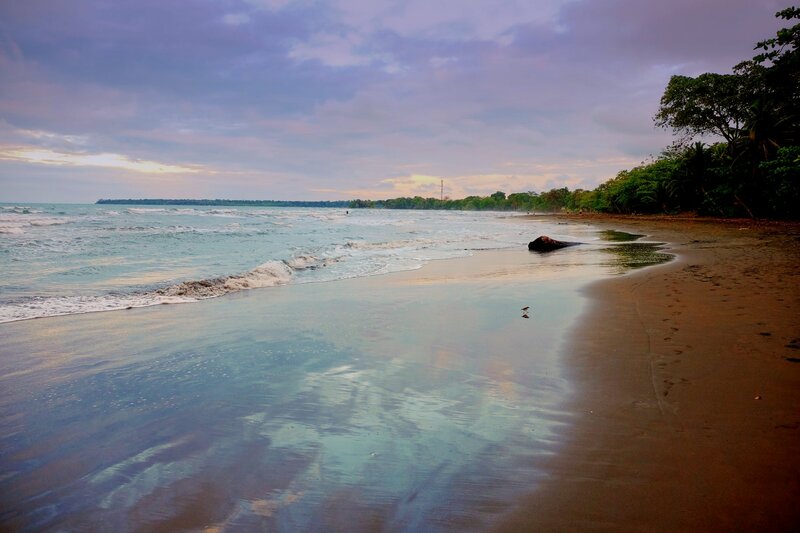 ← Dominical & Uvita beaches plus cave dwelling at Daimonte. Costa Rica has everything!